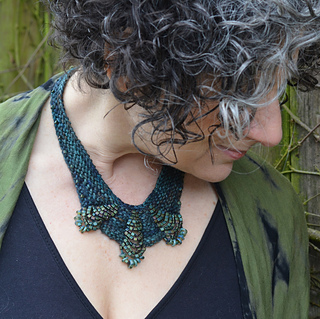 Deco is a beautiful knitted necklace in two lengths that features cascades of beads in a deliciously sensuous (and easy to knit) design. 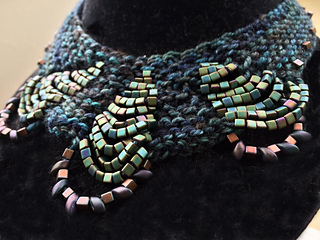 Beads are strung onto the yarn before casting on, and short rows are used for shaping. 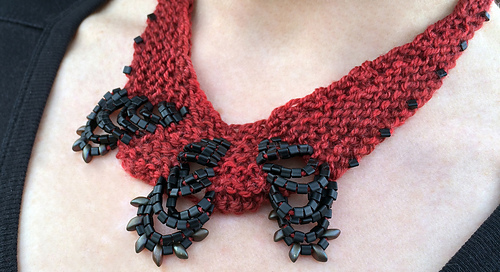 Most of the piece is constructed in garter stitch, which removes the need for concealing any wraps in the short rows. 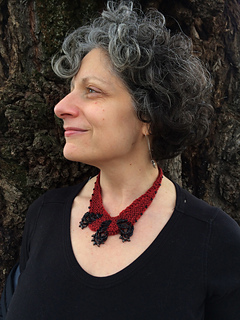 KAL Kits for this design with the yarn and beads shown in the picture are available, but only until January 21, 2015. The kits can be purchased here: http://siviaharding.bigcartel.com. I am offering these special KAL kits for a limited time only because the dyer has a tight schedule that we need to accommodate. For the yarn, I have chosen beautiful, luxurious Sunna from Spirit Trail Fiberworks, a merino/cashmere/silk blend that is truly amazing with beads. As you can see from the picture, the Chipotle colorway really pops! It will be a showstopping necklace. I get comments every single time I wear mine. A KAL will be taking place toward the end of February when people begin to receive their kits in the mail. Please join us on the Sivia Harding forum!